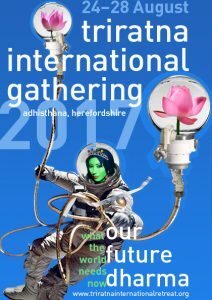 Green Tara: Astronaut arose out of the theme of the 2017 Triratna International Gathering, “Our Future Dharma”. Philosophically we can consider a being like Tara to exist, poetically, outside of time. 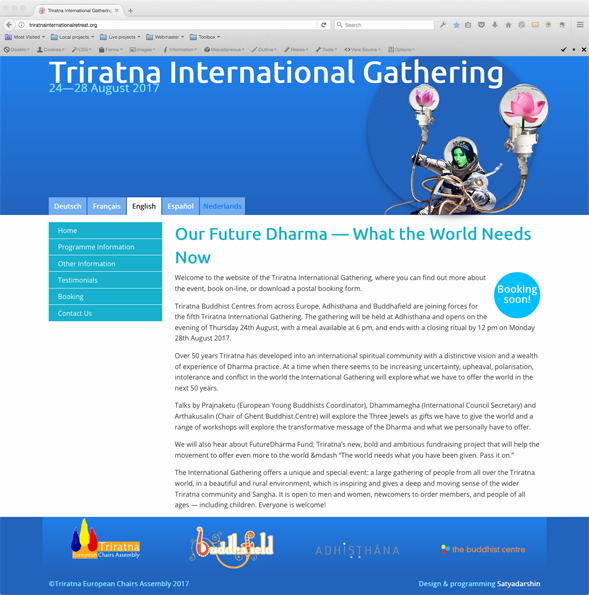 Here, however, she is representing the future of the teaching of the Buddha, known as the Dharma. Tara embodies many of the qualities of the so-called feminine principle. She is known as the Mother of Mercy and Compassion. She is said to give birth to warmth and compassion. Tara exemplifies kindness for all beings, just as a mother does for her children. She can be represented in a number of forms, of which the green-coloured form here (known more properly as Samaya Tara, or “Tara of the vow”) is one of the more popular. In many meditation practices featuring characters like Tara, they are said to emerge out of an infinite, blue sky. 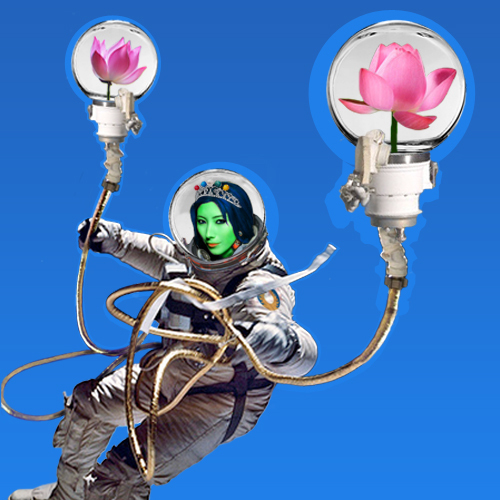 This project is a Photoshop collage representing Tara as an astronaut, bearing her traditional lotuses in their own mini space-habitats. The image was inspired by street art themes, with a deliberately subversive undertone. In traditional Tibetan iconography, Buddhist figures are represented from very strict, formalised patterns, with precise proportions. 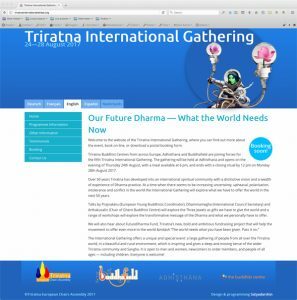 There has been a movement within the Triratna Buddhist Community to move away from the direct incorporation of Tibetan iconographic culture. This piece is both a recognition of the debt owed to that culture whilst associating with the wit of contemporary street art. I’m a very regular attender of the Glastonbury Festival (where I work in the Buddhafield Café) and a particular fan of the Sahngri-La area. Shangri-La is well known for its sardonic, anti-capitalist theme. I particluarly appreciate the large-scale collages and satirical posters, so this image owes a particular nod to the area’s design team. The font family is DIN. I think of DIN as being very clear, well-spaced, trim, and upright, but with an obvious softness. If it were a person, it might strike me as being very formal, but not harsh; strong words softly spoken. It is a good font in which to frame a touch of the subversive. In the parallel website project, the Ubuntu webfont substituted for DIN. In this graphic, Buddhist “deity” Green Tara has been treated to somewhat cheeky street art makeover, graphically manifesting the theme of the 2017 Triratna International Gathering, “Our Future Dharma”. This project demonstrates the application of Typography Adobe Photoshop, Adobe InDesign, Collage, and Typographic grid. Follow the links to see more projects using these skills.